Part of our annual pilgrimage to Motor City is selecting the best way to get there. Over the past few years, we’ve had an interesting array of rides. And we can’t say it’s always gone well. So when it came time to head for the 2017 North American International Auto Show, we offered Volkswagen a chance at redemption. 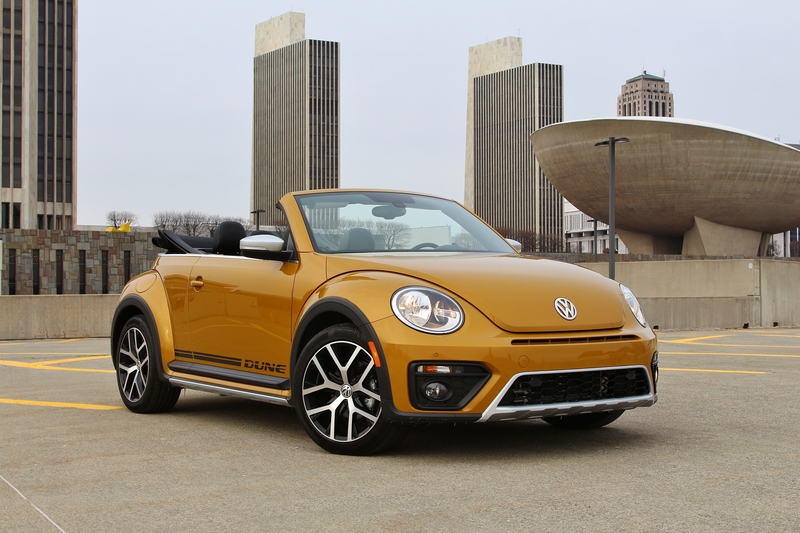 They offered us a pre-production 2016 Beetle Dune Convertible. I bet they think we’re crazy. And we are! Because on Sunday, January 8th at 8:00am, having topped up the fuel tank and adjusted all the tire pressures, we set off on a 1,400 mile trip. It was 11 degrees and our primary route, I-90, was closed to commercial traffic from Buffalo, NY to Erie, PA due to heavy lake effect snow. What could possibly go wrong! With the literal answer to that rhetorical question in the backs of our minds, we opted for a more southerly route. We managed to avoid snow all the way to Cleveland. 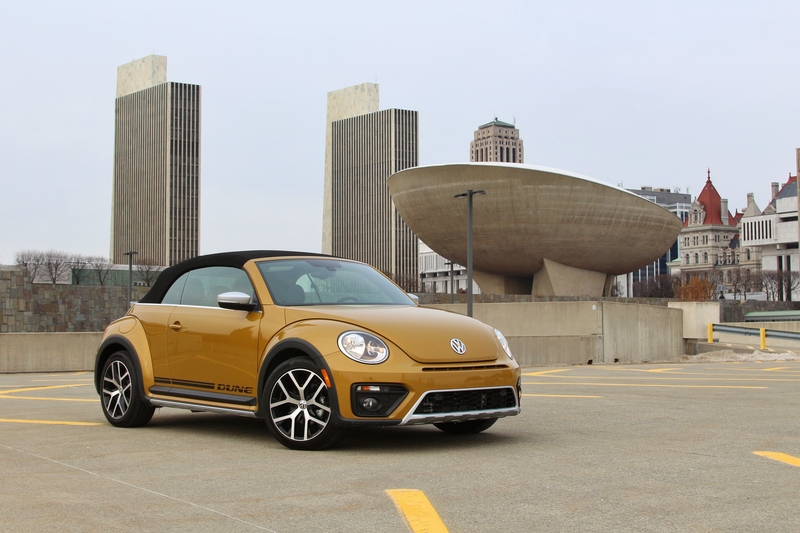 The Beetle Dune Convertible shares everything but a roof with its coupe counterpart. The price for this frivolity is 200 pounds of curb weight and $5,400 as compared to the hard top. The same 170hp turbocharged 1.8L engine and six-speed automatic transmission sit about a half-inch higher from the pavement. The Dune’s hallmark Sandstorm paint is available as well. It’s the only option on our tester. Thankfully satellite radio and heated seats are standard. We used both for almost the entirety of our 10-hour ride to Detroit. The long haul didn’t bother the Beetle or its occupants. The small trunk and 350-mile fuel range seem to be the only two limiting factors for how far and how long you could travel. The Dune’s seats were comfortable and well positioned. We only began to notice the firmness of the seat bottom after 8 hours of driving. That says volumes about VW’s ergonomics. Even in windy, below-freezing conditions, the roof wasn’t drafty and the cabin remained impressively quiet. After we wrapped our coverage of Debut Day, it was time to head out to some after-show events. This is where things could get interesting. Two years ago, we made it less than a mile from the hotel. If the Dune Convertible was able to surpass that, we’d be in unknown territory. The VW did just that, ushering us to our first destination, where a surprise was in store. Parked right outside the venue was another, identically equipped VW Beetle Dune Convertible press car. Detroit during auto show week; small world. The conditions for Wednesday’s return trip were drastically different from the few days prior. With temperatures reaching 50 degrees and winds in excess of 40 miles per hour, there were a host of new challenges for the Dune to face. But it somehow always feels easier going home. The Dune made fantastic time with success looming larger in the windscreen with each passing mile. Just after 6:30pm, the little Beetle crossed the finish line. With my esteemed colleague home safe, the Dune Convertible had successfully traveled 1,391 miles round-trip between Albany and Detroit. Over four days, we maintained an average speed of 68 mph and the Dune’s 1.8L turbocharged engine returned 28.8 mpg. For the last 30 miles of this self-paced endurance race, I was alone with my thoughts. Turning off the highway, the temperature hung at a brisk 42, but I knew what had to be done. I pulled over at the base of the ramp and put the top down. With its bright color and unique graphics, the Beetle Dune wears its heart on its sleeve. But the VW’s personality is also apparent behind the wheel. For nearly 1,400 miles, we weren’t able to let the Dune Convertible express itself. That’s the risk of driving a convertible in January. But for those last 15 miles, with the cool air in my face and the night sky above me, the VW Dune Convertible showed its true colors. It had redeemed its fallen brother. Sure, we’re a little crazy for wanting to drive to Detroit in January. 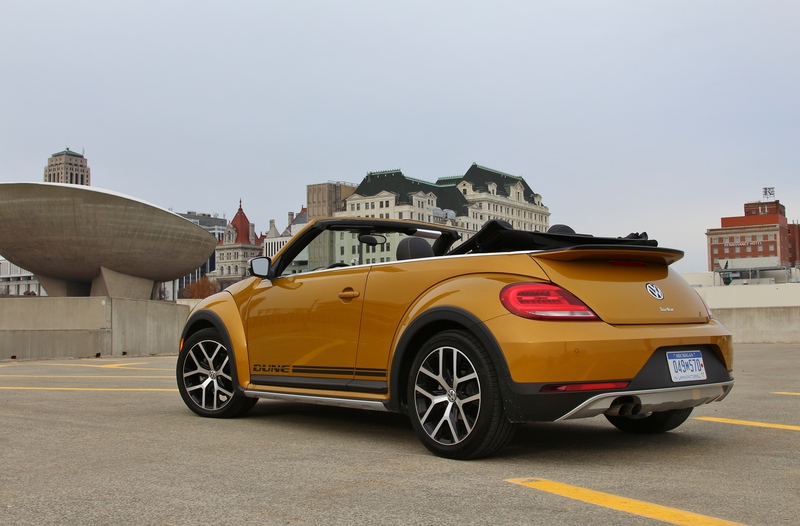 But the Beetle Dune Convertible is ok with that. And that’s the kind of car you want to take with you.